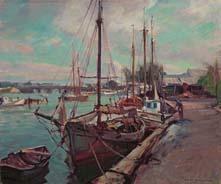 Born in Rochester, New York, Emile Gruppe became a renowned New England landscape and marine painter. Although he is best known for his variety of Impressionistic landscapes, he also painted figures and portraits. His modern style was largely inherited from French Impressionist Claude Monet. "Lily Pads," date and location unknown, one of Gruppes landscapes, attests to Monets influence and is similar to some of the paintings in Monets "Water Lily" series. Gruppe's prolific career brought him many awards and memberships. His popular painting "Winter, Vermont," date and location unknown, won the Richard Mitton Award at the Jordan Marsh Exhibition in Boston in 1843.